A new proposal exposes the inconsistency in Jakarta’s worldview. Recently, Rizal Sukma, a noted Indonesian expert and foreign policy advisor to the current government led by President Joko “Jokowi” Widodo, proposed the idea of an Asian Fulcrum of Four. According to Rizal, four Asian powers – China, India, Indonesia and Japan – would seek to build and shape a pan Indo-Pacific (or Pacindo). This is very similar to the idea of an Asian coalition of five put forth fifteen years ago by Indonesia’s then-president, Abdurrahman Wahid. Wahid had suggested a coalition comprised of China, India, Indonesia, Japan and Singapore. The group would not be a security pact, but an arrangement to facilitate political, economic and cultural cooperation that would allow three big countries to rise with the assistance of Japan and Singapore. Rizal’s idea of Asia’s own G-4 rests on five assumptions. First, it is predicated on the idea of Asian solidarity and an Asian Century that may have received new momentum from the recently concluded Afro-Asian conference in Indonesia in April 2015. Leaders of nearly 100 countries from Asia and Africa gathered in Indonesia to celebrate seven decades of Afro-Asian solidarity. Second, it seeks to build on the Indonesian experience as a regional architect. This is Jakarta’s key competency, as evidenced by its role in the growth and mushrooming of ASEAN-led initiatives for cooperation. Moreover, Indonesia is arguably positioned relative to the other three Asian powers. It has signed strategic partnerships with all these powers and sought to multi-align with them on the basis of parity and equidistant engagement. Third, it places the responsibility of order-building in the region in the hands of four major players within it, rather than parties from without. Indeed, the essence of the idea is that Asia’s key actors should jointly take charge of constructing regional order, rather than leave it up to external forces. Fourth, it builds on recent attempts among major Asian leaders to sustain dialogue and communication. Rizal notes that major powers are taking steps to address issues among them, including the U.S. and China, India and China, Japan and South Korea and Japan and China. This proposal is a departure from current regional trends on four counts. First, it stands apart from current trilateral arrangements – Australia-Japan-U.S.; India-Japan-U.S.; and Australia-India-Japan – in that it includes China. Second, it does not involve any extra-regional powers, excluding both Russia and the United States, engaging China – probably the only player that seems to be adamant about changing the status-quo. Third, this arrangement is not anchored on the region’s most successful cooperative platform – the Association of Southeast Asian Nations (ASEAN) and ASEAN-led initiatives. Finally, the proposal excludes three other important middle powers of the region – Australia, South Korea and Vietnam. Reiterating his idea of ASEAN as a confinement, Rizal downplays the role of ASEAN and underscores the strategic importance and necessity of the East Asia Summit (EAS). With respect to ASEAN, Rizal makes it clear that the grouping cannot maintain its centrality unless it sees the need for reform and initiates greater institutionalization. This line of strategic thinking suggests that while Jakarta may not be ditching ASEAN per se, it is going big and in a different direction. It is giving up what once former Indonesian President Yudhoyono called ‘geopolitics of cooperation’ and engaging in major power politics. As Barry Desker once put it, Indonesia as an emerging power is outgrowing ASEAN. Since Wahid’s proposal of an Asia-5, much has changed both in the region and in Indonesia. Rizal Sukma’s somewhat sibylline remark in 2009 that Indonesia was ‘punching below its weight’ due to its ASEAN confinement has led to an important debate within the country about its regional aspirations and status-consistent behavior. Indonesia has risen to become an Indo-Pacific power and an emerging power seeking parity in the regional echelon of major powers. Experts have bestowed various epithets on Indonesia – including emerging power, global swing state, emerging democratic power, the first Muslim democratic superpower, and ascending Indonesia. However, the proposal also exposes the inconsistency between entitlement and status-signaling in Indonesia’s own regional aspirations. While the idea of big-4 places Indonesia in the big leagues as an emerging power together with the likes of India, China and Japan and ensconces Indonesia’s pan-Indo-Pacific worldview, its continued adherence to its middle power approach effectively relegates Indonesia to a second-tier power status. If Indonesia can be part of this group as a middle power, then why can’t other Asian middle powers like South Korea, Australia, or even Vietnam also join as well? In short, it appears that Indonesia is thinking like a major power and acting like a middle power. This middle power approach is a step backward when the country is being recognized – or if it wants to be recognized – as an emerging power. All other three Asian powers, meanwhile, claim at least regional major power status. This inconsistency of aspiration also contradicts Rizal’s own caution against Indonesia punching below its weight. One may argue that it is not ASEAN confinement that compels Indonesia to punch below its weight, but rather its own self-imposed and restrictive middle power approach that limits Indonesia’s regional profile. If it is time to set up a group of big-4 in Asia that includes Indonesia, it is imperative that Jakarta first reset its regional demeanor. If Indonesia seeks parity with major powers, it must make up its mind about the status it seeks instead of floating between being a major and middle power. This confusion has dogged Indonesian leadership at least for the last five years. It is time rising Indonesia spells out an emerging power’s grand strategy. That would lend extra punch to Rizal’s idea of Asian Fulcrum of Four. Vibhanshu Shekhar is Asia Fellow at East West Center, Washington DC and Visiting Fellow at Paramadina University, Jakarta, Indonesia. 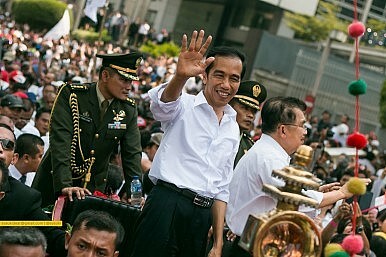 What Will Indonesia’s Foreign Policy in Jokowi’s Second Term Look Like? A look at how Jakarta’s role in the world may shape up in the coming years. Indonesia’s Indo-Pacific Approach: Between Promises and PerilsIndonesian Suspect Freed 2 Years After Killing of Kim Jong NamIndonesia’s 2019 Elections: Beware the Foreign Puppet Wars in the Jokowi-Prabowo RaceIndonesia-Vietnam Strategic Partnership: The Maritime DomainCan Indonesia Help MIKTA Thrive?